Akhil Sharma Post Graduate Scholar, Department of Kayachikitsa, Ayurveda Mahavidyalaya Hubballi, Karnataka, India. Prashanth A S Professor and Head, P.G Studies, Department of Kayachikitsa, Ayurveda Mahavidyalaya Hubballi Karnataka, India. S G Chavan Professor, P.G Studies, Department of Kayachikitsa, Ayurveda Mahavidyalaya Hubballi, Karnataka, India. All the functions of the body are controlled by three fundamental factors called Tridosha. As per Ayurveda, these are considered as ‘the pillars of the body’. Dosha’s in the state of equilibrium perform the normal functions of the body but when they get vitiated, they cause diseases. Urustambha is a lifestyle disorder and it is commonly seen in the higher socio-economic status. Sushrutha Acharya named this disease as Adhyavata.Urustambha is a grave condition, in which the patient’s thighs become painful, numb and immobile. In this disease, deranged Vata due to intake of Apathya Ahara Vihara sub-charged with the Meda and Kapha settle down into the lower limbs which gives rise to painful and immobile condition of the lower limbs. SHARMA, Akhil; S, Prashanth A; CHAVAN, S G. ROLE OF AVARNA IN THE ETIOPATHOGENEIS OF URUSTAMBHA. 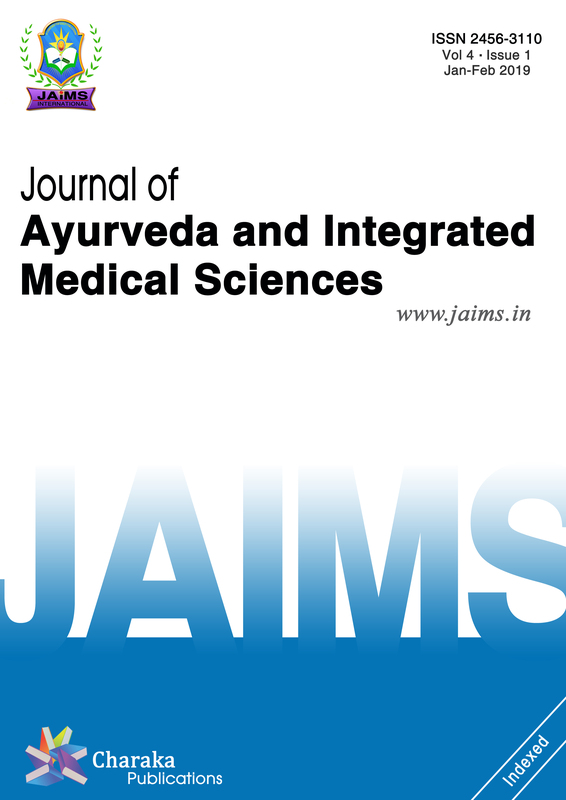 Journal of Ayurveda and Integrated Medical Sciences (ISSN 2456-3110), http://www.jaims.in/index.php/jaims/pages/view/Citation, v. 3, n. 4, p. 91 - 95, sep. 2018. ISSN 2456-3110. Available at: <https://jaims.in/index.php/jaims/article/view/604>. Date accessed: 25 apr. 2019. doi: https://doi.org/10.21760/jaims.v3i4.13289.